British chess grandmaster and one time world championship title challenger, Nigel Short, wrote an article for the Dutch magazine New in Chess recently, titled ‘Vive la Difference’ which claimed, provocatively, that there are genetic reasons why men are more successful in chess than women. The Norwegian Parliament recently approved a trial to include a one-hour a week chess class in schools for third and fourth grade students. The rapidity of strong chess tournaments have increased recently and it is becoming difficult to give coverage to all of them. As I conclude the lengthy Karpov interview discussing only Fischer, I was surprised when Karpov, over dinner in Nassau, noted that Fischer had legions of chess fans in the Soviet Union during his match with Spassky. 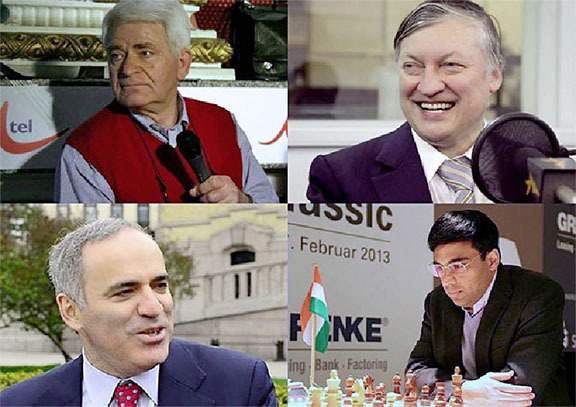 Here is the penultimate instalment of the Anatoly Karpov interview discussing Fischer. IF: When you were preparing with Geller and your team, what would a typical day be like? It is commonly felt that in chess as in life, when people cannot figure out what you are doing, they are kept in a state of confusion, uncertain and waiting. During the ‘Match’ following word that chess was categorized as another exciting version of the widespread draughts and which was delivered by a curious soldier of the former British empire who saw active service in the realm of the outer world, Mr Gomes, our village became a hub which was fired with a fervour for a board game which had not been noticeable in the past. Back in 1972, when Fischer opposed Boris Spassky for the world championship chess title, the game was propelled to an extraordinary high, which no one had ever realistically witnessed. In addition to offering a detailed analysis of his life experiences for the publication Sport Express, the 12th World Chess Champion Anatoly Karpov accommodated notable freelance chess writer Irwin Fisk with an interview which dealt solely with the American grandmaster Bobby Fischer. Today’s Chess Column continues the Anatoly Karpov Sport Express interview, which was done at the end of 2014. It was a distinct privilege for me to meet Russian grandmaster and former world chess champion Anatoly Karpov once in Nassau and subsequently in Curacao. For most countries, the national championship in a sporting discipline remains the celebrated feature of that particular event. 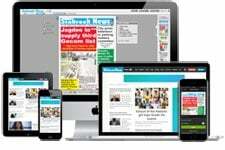 The Grenke Chess Classic Tournament, which was contested in Baden-Baden, Germany, turned out to be an exciting final as world champion Magnus Carlsen and Germany’s Arkadij Naiditsch battled to an Armageddon game to decide the winner of the tournament. Germany’s chess grandmaster Arkadij Naiditsch promoted a rook pawn to the queening square and so defeated world champion Magnus Carlsen at the Grenke Chess Classic at Baden-Baden. World chess champion, Norway’s Magnus Carlsen emerged victorious in the brutal Tata Steel Masters Chess Tournament in the Netherlands recently. The following games were played at the Tata Steel Tournament which is being contested in the Netherlands. Ukraine’s Vasily Ivanchuk took the lead after round four of the Tata Steel Masters Chess Tournament, in a tough competition which boasts the male and female world champions and the world’s number two chess player. This weekend, chess lovers will witness the beginning of the popular Tata Steel Chess Tournament in Wijk aan Zee, Netherlands. Perhaps an inspiring way to begin the New Year is to focus on one of the finest chess attackers of all time, Dr Alexander Alekhine, (Moscow 1892-Estoril, Portugal 1946). ‘Tomorrow is always fresh, with no mistakes in it yet’ -LM Montgomery, Anne of Green Gables The year 2014 is closing. Rose Hall town’s Kriskal Persaud, a former national junior and senior chess champion, looks tentatively at the chess board in his first game of the Umada Cup. Guyanese chess players are being given an opportunity to oppose some leading chess nations of the Caribbean owing to the hosting of the Umada Cup chess tournament locally. A sizeable number of chess aficionados, including a sprinkling of Guyanese, are viewing the live coverage of the World Championship Chess match via the internet. The most important activity on the World Chess Federation’s calendar, the World Chess Championship title match, began on Friday and runs until November 28. The strongest woman chess player of all time, Hungary’s Judit Polgar, 38, has retired from competition. Wesley So, 21, Filipino chess grandmaster currently playing for the US, won the Millionaire Chess Tourn-ament in Las Vegas recently and walked away with a tantalizing first prize of US$100,000. 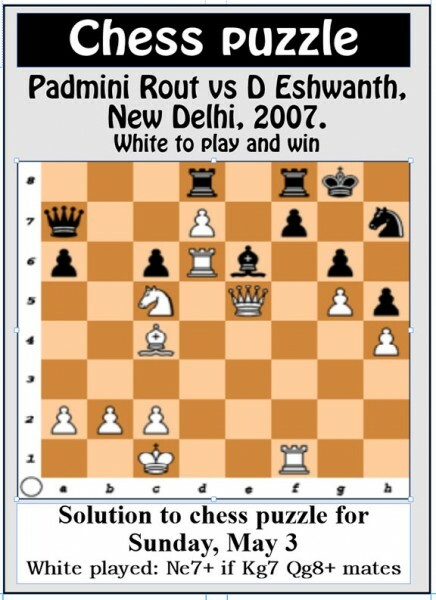 At the World Youth Chess Championships held in Durban, South Africa, the strength of India’s player-development programme was thrust into the forefront as the once obscure chess nation won two gold, two silver and two bronze medals. Magnus Carlsen, the 23-year-old Norwegian grandmaster and World Chess Champion who has demonstrated an extraordinary power over the finest chess players on the planet, has launched a chess playing app that allows players all around the world to challenge him. Someone once said that a picture is worth a thousand words. The photographs in this column are compelling, and focuses on the human dimension in chess. Whilst the charismatic 23-year-old Norwegian chess grandmaster and world champion Magnus Carlsen was competing in the USA’s Sinquefield Cup two weeks ago, India’s Vishy Anand was winning the Bilbao Masters Final simultaneously on the other side of the world, in Spain. The big news circulating in the international chess world is Fabiano Caruana’s riveting performances in the Sinquefield Cup, St Louis, USA. Why is chess important? This question has been de-bated over time. The answers are varied. We are approaching the final quarter of year 2014, and traditionally, there are three chess tournaments to be completed before the end of December. FIDE has announced details of the 2014-15 Grand Prix series which will qualify two participants for the world championship Candidates chess tournament. Guyana’s final round eleven game at Tromso in the 41st World Chess Olympiad pitted her against Palau, an island country in the Pacific Ocean. Guyana demolished a determined Burundi Olympic chess team on Tuesday 4-0 during the country’s current chess campaign in Norway. On the chess board , lies and hypocrisy do not last long -Emmanuel Lasker Guyana has been ranked 150th out of the 179 countries which are earmarked to participate in the 2014 Norway chess Olympiad, according to FIDE, the World Chess Federation. Guyana’s participation at the important 2014 Norway Chess Olympiad, scheduled for the beginning of August, represents a milestone for the sprinkling of local practitioners of the ancient game. The 2014 edition of the International Star Mixed Pair Tournament was won by the combination of Yasseer Seirawan and Zhu Chen, beating the pre-tournament favourites of Nigel Short and Hou Yifan. Uzbekistan was catapulted into the chess world when one of its nationals, nine-year-old Nodirbek Abdusattorov, beat a FIDE rated 2600 chess grandmaster, Andrei Zhigalko, in the first round of a local tournament. 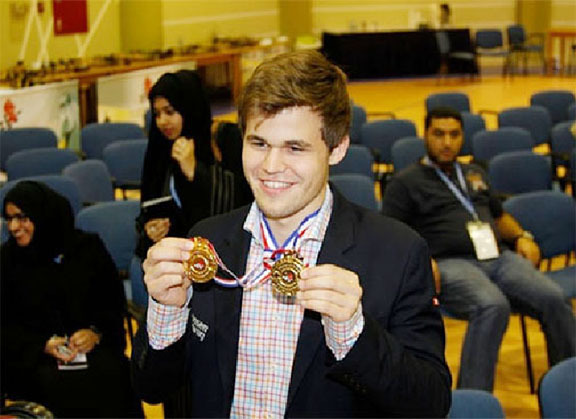 World champion Magnus Carlsen has won three coveted chess titles, making him the World Champion in the classical or conventional format, as well as in the rapid and blitz formats. A fair number of elite grandmasters, including world champion Magnus Carlsen, Anand, Caruana, Karjakin and Judit Polgar have been doing chess battle at the World Rapid and Blitz championships in Dubai, UAE. It is heartening to note that with last Sunday’s one-day rapid chess tournament, Engineering and Construction Incorporated (ECI) has successfully sponsored two tournaments this year. By scoring two wins in his first two games, Italian grandmaster Fabiano Caruana is calmly demonstrating he might even take the prestigious Norway Super-Tournament, which boasts in its line-up the four highest ranked players on the planet. China has won the women’s event in the Asian Nations Cup championship tournament that is currently being held in Tabriz, Iran. FIDE, the world chess federation, has published its first-ever Rapid and Blitz rating list allowing chess players to achieve proper and measurable ranks. During chess legend Garry Kasparov’s visit to Jamaica in April, he was asked to give compelling reasons why he should succeed the incumbent Kirsan Ilyumzhinov as president? The following game was the most anticipated one of the Gashimov Memorial tournament. The Gashimov Memorial tournament which is being held in Shakmir, Azerbaijan, from April 20 to 30, has attracted some elite players, including world champion Magnus Carlsen.